First, let’s clear one thing up. You might think that lighting large scale professional productions, the problems of lighting on a budget and technical shortages wouldn’t arise. After all, those guys don’t have to deal with a tiny school hall,only four circuits Front Of House and the spare cable you have is one 4 way 13A block. In reality, every show is constrained by technical limitations (not only a financial budget) and every LD has to make compromises. How ever many dimmers you have, you will always need a few more. A couple more circuits at stage level would be useful too. And if we could just afford another 12 VL’s (and had room on the truss to rig them – bloody noise boy junk), the colour wash wouldn’t have any holes in it. Many of problems are the same, whatever size the show. Let’s take a look at some workarounds for this “technical budget”. Not having enough lighting sources, especially conventionals, is a tricky one that can only really be solved by creative design decisions. At college, the Head of Lighting told us that every lantern had to do at least 2 jobs – “specials” had to pull their weight too. Perhaps you could use the DSC area toplight instead of a dedicated profile spot. If those breakup gobos were in a neutral colour, they could be mixed with two different colour washes to produce various effects. On very rare occasions, you might be able to do a refocus during the interval. Provided the original effect is not required in Act II, you can easily reach the fixture and the change can be made behind the tabs. You can’t clear the front row to get the ladders out. The idea of a quick half time refocus could also apply to a simple gel change. Either way, don’t forget to reset before the next show. If coverage of colour washes is a problem (not quite enough PARs for instance), the old trick is to “cross ’em over”. Firing a lantern from it’s rigged position across to the opposite side of the stage increases the throw distance (in tight venues, by a significant percentage), making the beam cover a wider area than when lighting it’s own side. Lighting “circuits” is a generic term for the system of outlets distributing power out to the rig. The circuits may be connected directly to the dimmers but often goes via a patch panel, allowing you to choose which dimmer a circuit(s) plugs into. “Pairing” up two fixtures, you obviously sacrifice control – the two lanterns will be powered by the same dimmer. Choosing fixtures that can be paired up is a question of lantern focus/job, colour or both. Pick the ones that can work together. Pairing up is limited to the maximum electrical load ratings of your cable, connectors and dimmer channels. If you want to balance the intensity of two lanterns with a significant difference in throw distance, they probably need to be on different dimmer channels and so can’t be paired up. Although you could be creative with some Neutral Density gel…. Creating more circuits at a lighting position comes down to running a single cable or a multicore of 6 circuits. Spare circuits are often found in the most “unuseful” places, like in the Control Room – not much help if you need another 2 for your US Cyc bar. Having dimmer racks with socket outlets on the front is handy for running extra “ways” locally. In our fantasy stage lighting world, every lantern has it’s own circuit and dimmer channel giving us the ability to balance the intensity throughout the rig. Back in the real world, we always seem to end up with more lanterns than dimmers. Again, pairing up 2 or more fixtures is the solution. If the two circuits are in different parts of the rig, pairing both circuits at the dimmer end of things is common. Similar to the idea of an interval re focus, we come to a common theatre trick – the interval Cross Plug. Again, this is based on the fact that a particular “special” is only used in Act I while another is only used in Act II. Taping the two circuit plugs together and marking them as Act 1 and Act 2, they live at the patch panel or dimmer rack, waiting their turn. Joining them together saves on confusion amongst the spaghetti or patch cords. I used to work on theatre shows that had Cross Plug cues that ran to quite a few circuits each time – part of the routine en route for a cup of tea in the Green Room after the first half. There is no reason, of course why a cross plug has to happen in the interval provided there is someone to do it and it can be done silently during the show as the cues dictate. This is common in smaller lighting systems with limitations placed by the number of individual channels of control the lighting desk has. Matt recently asked a question about the Fat Frog, which has the ability to control 12 intelligent fixtures and 48 individual dimmer/single DMX channel faders. (BTW, thanks Matt for providing the idea for another article – always appreciated). So while one DMX universe has 512 channels, the actual number of “things” we could control is 36. Make sure that you are already using Wide Mode if your lighting desk has it. There are a number of solutions to limited channel control depending your kit. Like “pairing” they all cut down the number of individual levels you can set in the rig, so control “group” decisions are made on the same basis. 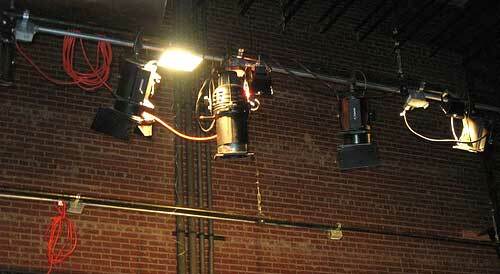 This has become more common with the use of LED fixtures on small DMX lighting desks. Setting a group of fixtures to the same start address means they all do the same thing, but this doesn’t always matter. [More on LED Lighting Control…] Setting moving heads or scanners to the same start address is pretty pointless because they share the same Pan and Tilt values. It could get you out of a hole in a disco environment, I suppose. Setting dimmers to share DMX start addresses can also be a solution, particularly if you find yourself with a load of kit and 6 channel 1 preset controller. You could run 100’s of kilowatts of dimming from one fader if you really needed to. Patching DMX addresses to desk channels within the console (softpatching) throws up a couple of options. Assigning multiple DMX channels (our dimmers) to one desk fader is one eg.001 + 037 + 095. The other option is only patching the DMX addresses of kit you actually need. This could happen with a large static rig that you don’t intend every bit. In Jan 2008, I finished a little tour with a show at the Purcell Rooms on London’s South Bank. The house rig was a good size (can’t remember how many dimmers but probably a hundred and something plus scrollers, maybe moving heads). Now, bearing in mind that in some venues we used 12 ways of dimming and rigged from tripod stands, we definitely weren’t going to need all their kit! (In fact, I seem to remember running the entire rig from a 13A ring main in the Jersey). Having tucked the Zero88 Jester 12/24 under my arm, I climbed the cat ladder to the control booth. Shoving the Strand 520/530i GTE Twin OverHead Cam (or something) outta the way, I nicked a DMX universe and patched up the 24 channels of house rig that were actually required. Anything to avoid using a 500 but that’s another story. Anyway, patch up only what you need and double up DMX addresses on desk channels using the softpatch facility. Problem: Can’t afford lampie toys to play with/ Teachers won’t let me buy Var*lites / Our venue was designed by an idiot / The budget doesn’t cover chocolate Hobnob’s…. We’ve hit the limiters with this one. Every show has equipment and technical availability budgets, not just financial ones. Even whizzy nodding buckets and waggly mirrors can’t solve everything (see the Open Letter to Directors). Most of the above solutions simply require compromises which, from a lighting designers’ point of view, often means a reduced degree of control. The technical answers to the “budget” are not complex. The hardest part is deciding where you can afford make those compromises. I love the comments above, but nobody seems to mention the ‘inter-scene’ re-patch, which allowed many shows that I did as an operator early in my career to look good (or at least goodish). Dashing from the desk to re-plug racks is instructive. I guess even this can help. Addressing two scanners the same address and invert any one pan or tilt or both. I use to do this wen i use to program with a small console.